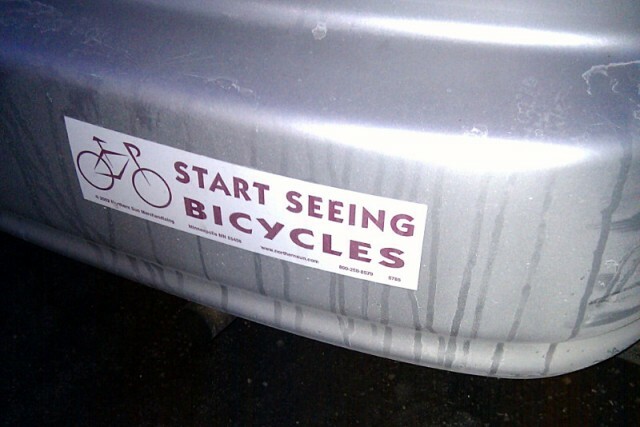 This bumper sticker was spotted offering practical advice in Ward 29’s Playter Estates neighbourhood on Monday night. We’re conducting a survey this week, both online and in person at the Taste of the Danforth, about cycling in and around Ward 29. If you completed the survey at our June meeting, there’s no need to fill out this one as well; we already have your answers. Please take a few moments to fill out the survey (there are just ten multiple-choice questions) or talk to one of our volunteers at the Taste of the Danforth this weekend.